This past Saturday, three of our 1st year students, Brittany Dolph, Geneva Griswold, and Casey Mallinckrodt, presented a poster at the Southern California Society for Microscopy and Microanalysis (SCSMM) meeting on a project they and their classmates conducted to identify pigments on a group of Kuba masks from the Fowler Museum at UCLA. The project was undertaken as part of a course on microscopy and microanalysis offered in the conservation program. The analysis of the pigments and binders used on the masks was done not only by students in the UCLA/Getty Program but was truly a collaborative effort involving students from UCLA’s Dept. of Material Science and Engineering, UCLA’s Archaeology Graduate Interdepartmental Program, UCLA’s Dept. of Bioengineering, and the Dept. of Anthropology, CSU, Fullerton who all took the class and lent their different expertise to the project. 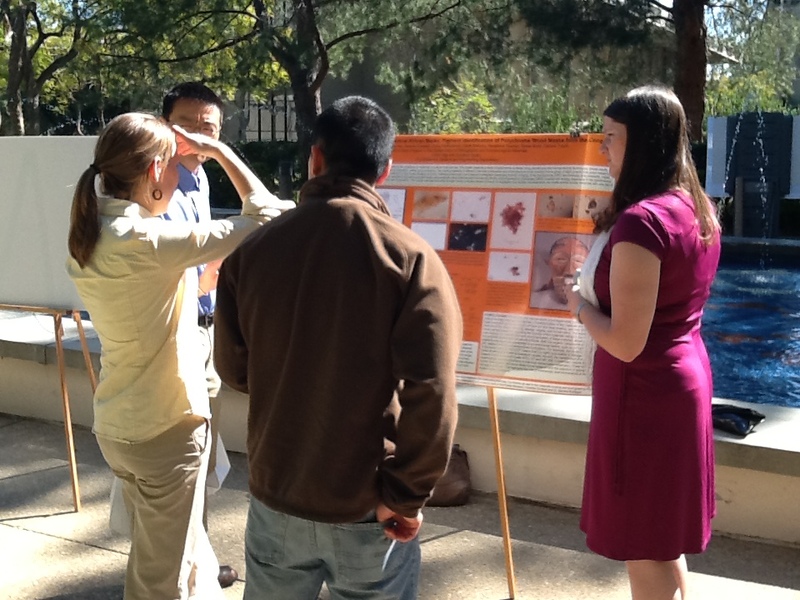 Geneva Griswold and Brittany Dolph discuss their poster with attendees of the SCSMM meeting. The treatment of surfaces in African masking traditions reflects the adaptation of materials for cultural ritual and use. This poster presents a study of polychrome surfaces using microscopic and microanalytical techniques, whose results provoke questions regarding the masks’ methods of manufacture, material adaptation, dating and provenance. The coloring materials of different chemical composition and microstructure were sampled from a group of eight polychrome wood masks from the Kuba region of the Democratic Republic of Congo and now in the collection of the Fowler Museum at UCLA. Following a thorough non-invasive investigation employing forensic imaging, X-ray fluorescence (XRF) spectroscopy and ultraviolet, visible, near infrared (UV/Vis/NIR) spectroscopy, dispersion and cross-section samples of the wood and paint layers were analyzed using polarized light microscopy (PLM), scanning electron microscopy (SEM) coupled with energy dispersive X-ray spectroscopy (EDS) and X-ray diffraction (XRD) in order to ascertain their chemistry and composition. The results indicated that while all eight masks analyzed shared common iconographic and stylistic characteristics, six masks exhibit similar materials with only two of the masks being outliers. Categories: Conferences, SCSMM | Tags: dispersions, Kuba, masks, microanalysis, pigment, polarized light microscopy (PLM), SCSMM | Permalink.